The Slider block tunes the value of the connected block parameter during simulation. For example, you can connect the Slider block to a Gain block in your model and adjust its value during simulation. You can modify the range of the Slider block's scale to fit your data. Use the Slider block with other Dashboard blocks to create an interactive dashboard to control your model. Dashboard blocks do not use ports to make connections. To connect Dashboard blocks to variables and block parameters in your model, use connect mode. Connect mode facilitates the process of connecting Dashboard blocks in your model, especially when you want to connect multiple blocks at once. If you only want to connect a single Dashboard block, you can also use the Connection table in the block dialog box to make the connection. Dashboard blocks cannot connect to variables until you update your model diagram. 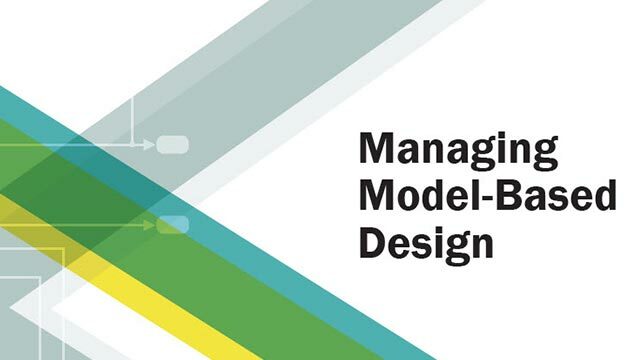 To connect Dashboard blocks to variables or modify variable values between opening your model and running a simulation, update your model diagram using Ctrl+D. Tunable parameters connected to Dashboard blocks are logged to the Simulation Data Inspector, where you can view parameter values along with logged signal data. You can access logged parameter data in the MATLAB® workspace by exporting the parameter data from the Simulation Data Inspector UI or by using the Simulink.sdi.exportRun function. For more information about exporting data with the Simulation Data Inspector UI, see Export Data from the Simulation Data Inspector. The parameter data is stored in a Simulink.SimulationData.Parameter object, accessible as an element in the exported Simulink.SimulationData.Dataset. Parameters specified by indexing a variable array do not appear in the Connection table. For example, a block parameter defined as engine(1) using the variable engine does not appear in the table. To access the parameter in the Connection table, assign the indexed value to a scalar variable, such as engine_1. Then, use the scalar variable to define the block parameter. When you simulate a model in external mode with the Default parameter behavior set to Inlined, Dashboard blocks can appear to change parameter and variable values. However, the change does not propagate to the simulation. For example, the Gain block displays changes made to its Gain parameter using the Dashboard blocks, but the Gain value used in the simulation does not change. Select the variable or block parameter to control using the Connection table. Populate the Connection table by selecting one or more blocks in your model. Select the radio button next to the variable or parameter you want to control, and click Apply. To see workspace variables in the connection table, update the model diagram using Ctrl+D. 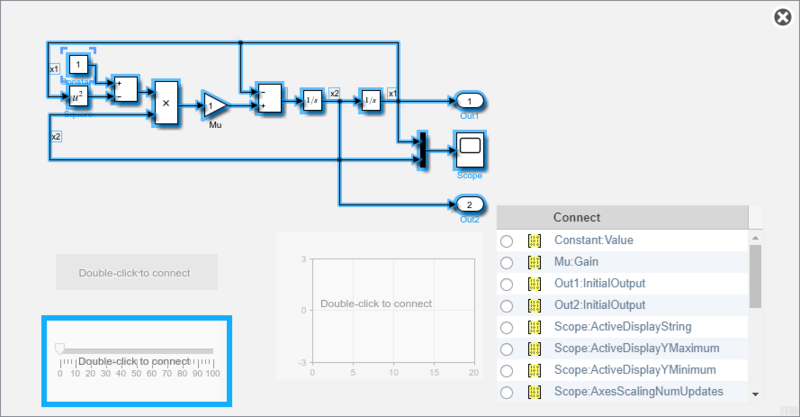 To programmatically connect a Dashboard block to a tunable parameter or a variable, use a Simulink.HMI.ParamSourceInfo object. The Simulink.HMI.ParamSourceInfo object contains four properties. Some of the properties apply to connecting Dashboard blocks to parameters, and some apply to connecting Dashboard blocks to variables. Not all fields have a value for a connection because a given Dashboard block connects to either a parameter or a variable. Type of scale displayed on the control. Linear specifies a linear scale, and Log specifies a logarithmic scale. Finite, real, double, scalar value specifying the minimum tick mark value for the arc. The minimum must be less than the value entered for the maximum. To programmatically set the Minimum parameter, use a 1-by-3 vector containing values for the Minimum, Tick Interval, and Maximum parameters, in that order. To use the auto value for the Tick Interval, leave the Tick Interval position in the vector empty or specify -1. Finite, real, double, scalar value specifying the maximum tick mark value for the arc. The maximum must be greater than the value entered for the minimum. To programmatically set the Maximum parameter, use a 1-by-3 vector containing values for the Minimum, Tick Interval, and Maximum parameters, in that order. To use the auto value for the Tick Interval, leave the Tick Interval position in the vector empty or specify -1. Finite, real, positive, integer, scalar value specifying the interval of major tick marks on the arc. When set to auto, the block automatically adjusts the tick interval based on the minimum and maximum values. To programmatically set the Tick Interval parameter, use a 1-by-3 vector containing values for the Minimum, Tick Interval, and Maximum parameters, in that order. To use the auto value for the Tick Interval, leave the Tick Interval position in the vector empty or specify -1. Tune the relative slip in a model of an anti-lock braking system using Dashboard blocks.